Join Our Team! - Get Your Goddess On! "The People You Bless Become Your Blessings." "When someone shops Paparazzi for the first time they keep coming up to me and asking, How Much Is This One? And I say, FIVE DOLLARS. They just can't believe it's our price point! When it finally sinks in that EVERYTHING is just five bucks that's when the big smile hits. Its my favorite moment at every show I do. I just wait for that smile, because it's all over my face too!" 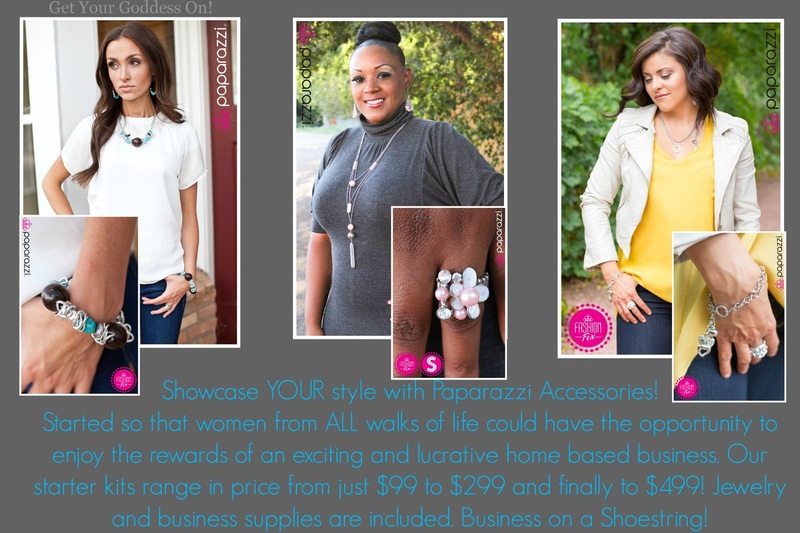 What can I do with my Paparazzi Accessories business? If you are like me when I first signed up, you're answering that question right now! You are thinking about the people who will love having a chance to purchase $5.00 accessories and your mind is whirling with ideas and plans! Fantastic! That is exactly what you should be feeling right now! In order to get off on the right foot in this business you need inventory. We are not a catalog company. Our fantastic styles are changing weekly and we just can't keep up with a print catalog! Fantastic problem to have, right? In order to stay on trend and bring you the very best of the latest styles Paparazzi updates our inventory often. This means almost every time I visit my shopping site I'm going to find new styles, new colors, new trends, new everything! I love Paparazzi Accessories for this visionary approach to direct sales. I'm not stuck with the same looks for 6 months out of the year like catalog jewelry companies. The best news is that our kits have exclusive items that change monthly! Plus, you'll receive a palette of colors and styles based on the season's current trends! You'll be getting dozens of one of a kind items that you'll love. You won't purchase a set and then see it on the gal in the neighboring cubicle the next day at work. No way! Our jewelry is fresh, unique, fun and affordable! 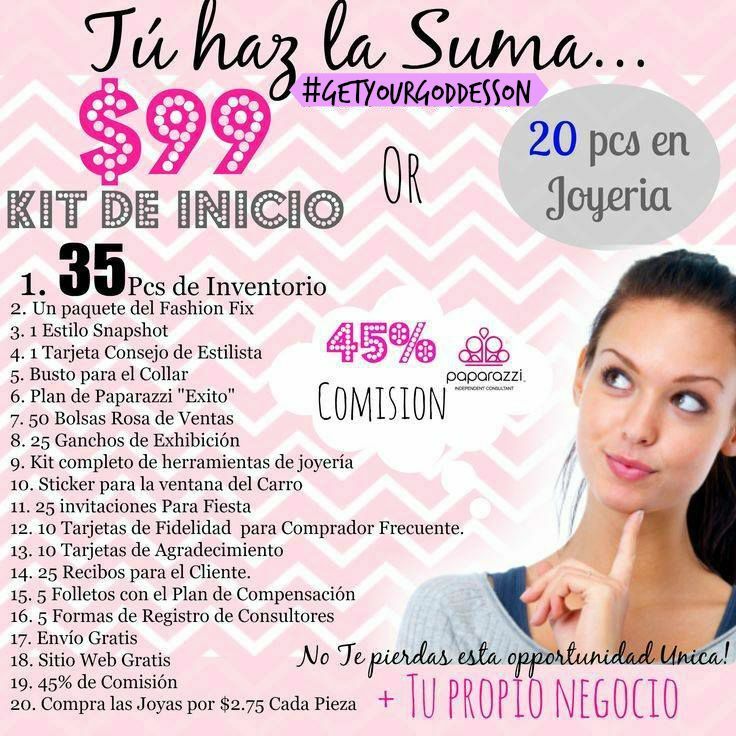 Beyond that, you can get started in a jewelry business for $99.00! Crazy right? Once you start selling Paparazzi it won't be long before someone will ask you how THEY can sell Paparazzi too! That opens up another side of our business to you! We call that team building, and building teams is fun and lucrative. Right now your very first step is getting a kit. Let's take a look at our complete line of starter kits so that you can choose the one that best fits your budget! Paparazzi is sweeping the nation right now. Our company has been growing by leaps and bounds for several years now and while we are continuing to move into new areas there is so much growth potential out there! We are just getting started! Chances are excellent that your area is wide open and you will be one of the first women bringing Paparazzi to your town! 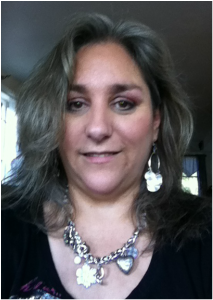 If you think you can sell this jewelry for five bucks a piece then we want to speak with you! Click the Sign Me Up button and then scroll to the bottom of the page. Click the button that says Join Now! ﻿﻿We are looking for excited people to help us build teams across the country. Contact me today to claim YOUR spot!